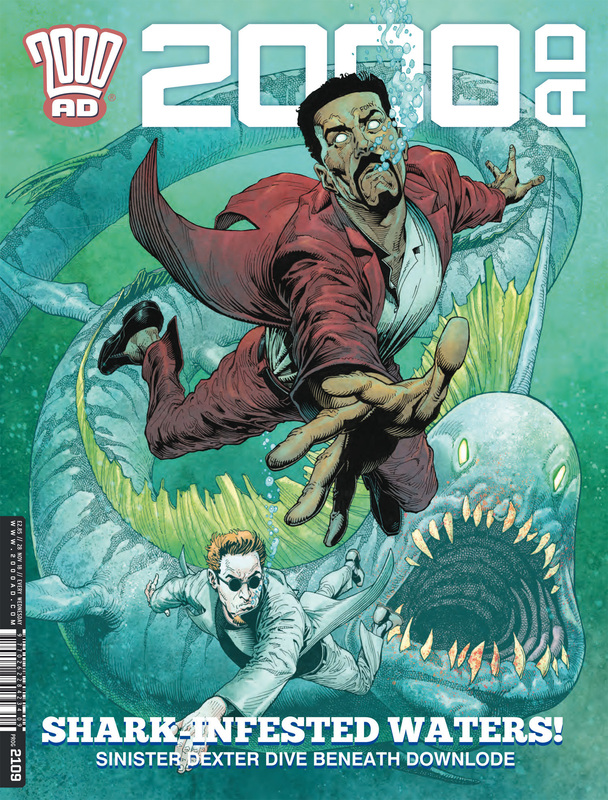 Some thoughts on the latest issue of 2000AD – Prog 2109 – including the final part of the excellent Judge Dredd arc, The Small House! An excellent cover for the return of Sinister Dexter! OK, wow! This has been an excellent arc. Yes there have been some sad bits (the deaths), but also some excellent storytelling. I like the way it was all set up. Possibly with some interesting side stories to tell too. The has tied off some of the issues Dredd has, but I think the fallout may be pretty bad too. The reaches back over the years to Judge Cal! Wow again! It’s always good to see the duo back and Ramone is still having trouble with thought bubbles. It continues to be fun, as is his reaction to them. I like this extra look at the city too. It makes sense to have something like this, and the addition to the crime is well done! Gene is getting smarter, but he’s also getting lucky, with some dangers averted, there are some interesting points in this issue. It looks like the chase is on, and Gene and his partners will have thier work cut out. Just as this series looks like it’s ending, it finds good ways to move things forward!